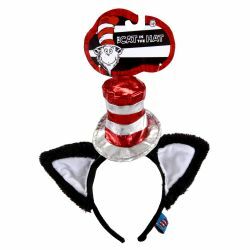 This is the officially licensed Dr. Seuss Cat in the Hat headband. It can be paired up with our other cat in the hat costume accessories to create your own Cat in the Hat Costume. The deluxe Dr. Seuss Cat in the Hat headband is colored as pictured. Hat on a flexible band and will fit any head size.